The CK1010-7 series is a widely used screw-in type bulb. In conjunction with a CK1010-8 socket they may be used in table lamps or in areas where easy bulb replacement is desirable. The small gauge wires from the CK1010-8 socket may be connected either to a CK1004 plug or brass braded directly into a conductive tape run. 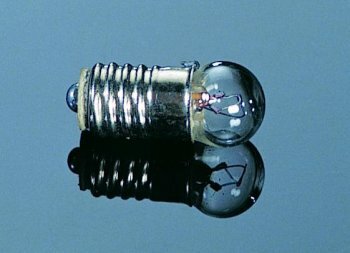 Diameter of the glass envelope is approximately 1/4" with an overall bulb length of approximately 9/16". The CK1010-7C bulb may be used either with a 9-volt battery or as an extra-bright light source for 12-volt electrical fixtures. The CK1010-7B bulb is a replacement bulb for the CK865 Glowing Embers. 2,500 hour bulb life.